He, Q., Shi, H., Gu, H., Naka, G., Ding, H., Li, X., Zhang, Y., Hu, B., and Wang, F. (2016). "Immobilization of Rhizopus oryzae LY6 onto loofah sponge as a whole-cell biocatalyst for biodiesel production," BioRes. 11(1), 850-860. Whole cell biocatalysts for biodiesel production have garnered significant attention in recent years, as they can help avoid the complex procedures of isolation, purification, and immobilization of extracellular lipase. Because of its renewability and biodegradability, loofah (Luffa cylindrica) sponge is an advantageous substitute for traditional biomass carriers in whole cell immobilization. Rhizopus oryzae mycelia can spontaneously attach onto loofah sponge particles (LSPs) during cell cultivation. The highest immobilized R. oryzae cells concentration can reach up to 1.40 g/1 g of LSPs. The effects of biocatalyst addition and water content on methanolysis for biodiesel production were investigated in this paper. The operational stability of glutaraldehyde-treated biocatalyst at 35 °C, using a 1:1 oil-to-methanol ratio, was assayed, revealing a 3.4-fold increase in half-life compared with the untreated biocatalyst. Under optimized conditions, the yield of methyl esters in the reaction mixture reached 82.2% to 92.2% in each cycle. These results suggested that loofah sponge is a potential fungi carrier for an immobilized whole-cell biocatalyst. Biodiesel (fatty acid methyl esters), produced primarily by the transesterification of vegetable oils or animal fats with methanol or ethanol, has received increased attention in recent years because of its nontoxicity, renewability, and biodegradability. Consequently, it has become an increasingly important substitute for conventional fossil fuels (Ma and Hanna 1999; Juan et al. 2011). The process of chemical methanolysis, using alkali catalysis, produces a high yield of methyl ester (ME) in a short reaction time; however, there are several drawbacks existing during and after the reaction, such as environmental pollution and excessive consumption of methanol and energy (Ban et al. 2002; He et al. 2008; Sun et al. 2011). The use of lipase catalysts can overcome the aforementioned shortcomings, but the high cost of lipase is a significant barrier to large-scale biodiesel production (Ban et al. 2001; Li et al. 2008). Utilizing whole cells as catalysts can reduce the cost of biodiesel production by avoiding the complex procedures of isolation, purification, and immobilization of extracellular lipases. It has been reported that use of polyurethane foam to immobilize R. oryzae as a whole cell biocatalyst can be used for biodiesel production with many advantages, such as easy immobilization of cells and convenient separation of catalysts (Ban et al. 2001, 2002; Li et al. 2007b). However, polyurethane foam is a polymer material that cannot be biodegraded after a batch reaction, thus increasing its overall cost and environmental footprint. Loofah (Luffa cylindrica) is produced in most tropical and subtropical countries. As an easily available and inexpensive vegetable, the loofah can be prepared as a porous sponge, and it is similar to polyurethane foam in structure, after peeling and desiccation. The sponge is made up of an open network of ﬁbrous support, providing sufficient and instant contact of immobilized cells to the surrounding aqueous medium (Saudagar et al. 2008). Loofah sponges are widely used in washing and cleaning applications. Additionally, the sponges can be naturally and thoroughly biodegraded by microorganisms because its main ingredient is lignocellulose. 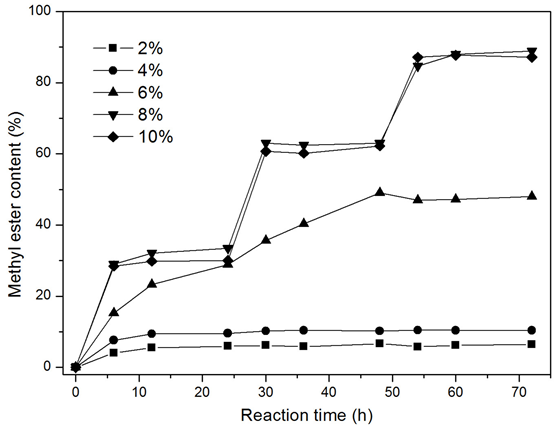 Previous studies have found that using glutaraldehyde (GA) cross-linking treatment on R. oryzae whole cells can improve the stabilization of the biocatalyst for repeated batch operation in biodiesel production (Ban et al. 2002; Sun et al. 2010). In this study, loofah sponge particles (LSPs) were used as biomass support particles (BSPs), in the form of whole cell biocatalysts, to immobilize Rhizopus oryzae LY6 for biodiesel production. The immobilized performance of LSPs and the catalytic performance of the biocatalyst were systematically assessed. 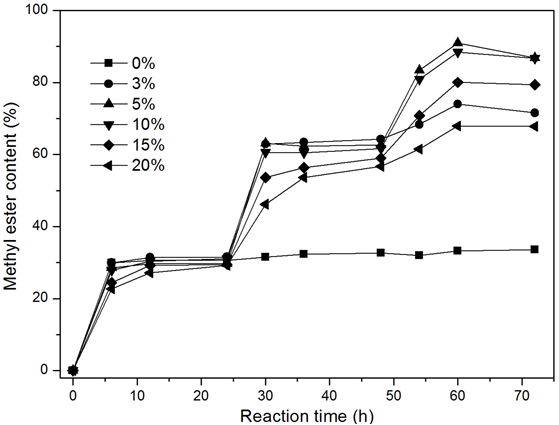 In addition, the effect of LSP addition on biomass immobilization, biocatalyst addition, water content in methanolysis, and reusability of GA cross-linked cells for repeated batch operations were investigated. Rhizopus oryzae LY6, a mutant of R. oryzae DSM 853 created by ultraviolet radiation, was obtained from the researcher’s lab (Li et al. 2011). The basal medium contained the following ingredients (w/v): 7% polypepton, 0.1% NaNO3, 0.1% KH2PO4, 0.05% MgSO4·7H2O, and 3% olive oil. Refined soybean oil was purchased from Suguo Co. (Nanjing, China) and the average molecular weight was determined to be 883 g/mol. Polypepton was acquired from Nihon Seiyaku Kogyo KK (Tokyo, Japan). Loofah sponge was purchased from Luokang Co. (Zhenjiang, China). Heptadecanoic acid methyl esters (as the internal standard) were purchased from Sigma-Aldrich (St. Louis, MO). All other reagents were acquired commercially and were of analytical grade. Loofah sponges, used as BSPs, were first cut into cubic pieces (5 to 7 mm) and placed in a flask with the medium subjected to prior sterilization. About one million R. oryzae LY6 spores were transferred from an agar plate to 500-mL flasks, each containing 100 mL of the basal medium with different amounts of LSPs (1.75, 2.00, 2.25, 2.50, 2.75, and 3.00 g), and incubated at 28 °C for approximately 72 h on a reciprocal shaker at 180 rpm. LSP immobilized cells were separated from the culture broth by filtration. After two 30-s washes with tap water, they were dried in a -40 °C FDU-1200 lyophilizer (Eyela, Tokyo, Japan) until a constant weight was obtained, then kept in the refrigerator at 4 °C for storage until further use. A JSM-7600F scanning electron microscopy (JEOL, Tokyo, Japan) was adopted to investigate the surface morphology of this biocatalyst. The net weight of the biomass immobilized on LSPs is the difference in weight of the LSPs before and after immobilization. The data was replicated at least three times for three independent samples. The GA treatment was carried out by incubating the washed LSP-immobilized cells in 0.1% GA solutions (0.1 M phosphate buffer, pH 6.8) at 25 °C for one hour. After separation by filtration, the GA-treated cells were shaken in a phosphate buffer, kept at a temperature of 4 °C for 5 min, and washed twice with tap water for 30 s. Subsequently, the LSP-immobilized cells were dried in a -40 °C lyophilizer until a constant weight was obtained and then kept in a refrigerator at 4 °C for storage before being used as biocatalysts. The methanolysis reactions were performed in a 50-mL screw-cap bottle at 35 °C in a reciprocal shaker (180 rpm). The reaction mixtures consisted of 9.65 g of soybean oil and varying amounts of LSP-immobilized cells (from 2% to 10%, based on the weight of soybean oil) in the phosphate buffer (0.1 M, pH 6.8). To fully convert the oil to corresponding ME, at least three molar equivalents of methanol are necessary (Ban et al. 2002). Consequently, 1 molar equivalent of methanol (0.35 g methanol against 9.65 g soybean oil) was added stepwise at 0, 24, and 48 hours, respectively. At the specified time intervals, 100 µL of methanolysis products was taken from the reaction mixture and analyzed by capillary gas chromatography (GC). After the reaction, the LSP-immobilized cells were washed with tap water and hexane and dried at room temperature for 24 h for each repeated batch. where A0 is the yield of ME after the first batch reaction; A is the yield of ME at time t; t is the reaction time; Kd is the deactivation coefficient; and t1/2 is the half-life. The ME contained in the reaction mixture was quantified using a 7890A gas chromatography machine (Agilent, San Diego, CA) equipped with an HP-5 capillary column (30 m × 0.32 mm × 0.25 mm; Agilent, San Diego, CA). Samples of 100 µL were taken from the reaction mixture at specified times and centrifuged at 13,000 rpm for 3 min, and the top liquid layer was separated for GC analysis. Precisely 30 µL of the sample and 570 µL of 0.526 g/L heptadecanoic acid methyl ester (hexane as the solvent), which served as the internal standard, were thoroughly mixed. The column temperature was kept at 170 °C for 0.5 min, heated to 200 °C at 3 °C min-1, maintained for 10 min, and then heated to 260 °C at 20 °C min-1. The injector and detector temperatures were set to 250 and 260 °C, respectively. To examine the effect of LSP addition on cell immobilization in cultivation, different amounts of LSPs were added to 100 mL of the basal medium. The R. oryzae mycelia became immobilized well within the LSPs as a natural consequence of their growth during the shake-flask cultivation. Comparing Fig. 1 (a) and (b), we can clearly see that R. oryzae mycelia were firmly attached to the LSP after cultivation, demonstrating a favorable immobilization performance. No evident detachment of cells from LSPs was observed in subsequent biodiesel production. The dried biocatalysts were weighed after cultivation, and the immobilized biomass and cell concentrations on the LSPs were calculated. Table 1 presents data on the cells’ weight and concentration on LSPs, with various LSP additions in cell cultivation, after drying. Data are presented in the form of mean values and the standard deviations for the replicates. As shown in Table 1, the weight of immobilized cells initially increased with the rise in LSP addition during cultivation and was able to maintain high levels when the addition was over 2.50 g. Inversely, the concentration of immobilized cells was initially maintained at a high level [g (cells) g-1 (LSPs)] with the rise in LSP addition, then decreased remarkably as more LSP was added during cultivation. This trend is most likely due to the fact that the cells could not fully grow on excessive LSPs with limited nutrients in the culture medium under certain culture condition. To maximize the amount of biocatalyst with a full mycelia attachment, 2.25 g of LSPs was used in subsequent experiments. To determine the optimal quantity of biocatalyst, various amounts of immobilized dried cells were added to the reaction mixture. Previous studies have reported that high methanol concentrations can lead to an irreversible denaturation of the lipase (Ban et al. 2001; Du et al. 2004; Zeng et al. 2006). Thus, the reactions were conducted with three stepwise additions of methanol with 10% water content (phosphate buffer, 0.1 M, pH 6.8; based on the weight of soybean oil). As shown in Fig. 2, the ME content had an insufficient amount of biocatalyst after a 72-h reaction, which can be attributed to the unreacted methanol accumulated in the reaction mixture, leading to the irreversible denaturation of the lipase. The highest ME content, 88.9%, was attained when the reaction mixture contained 8% immobilized dried cells. It was hypothesized that a greater percent of immobilized dried cells could increase the reaction rate and ME yield, but the yield slightly decreased when the addition of immobilized dried cells (10%) was above the optimal level of 8%. This was ascribed to the fact that more particles would obstruct the mass transfer (Arumugam and Ponnusami 2014). Moreover, superfluous enzymes could retard lipase activity (Calero et al. 2014). Fig. 2. The effect of biocatalyst addition on methanolysis for biodiesel production. Reaction conditions: 35 °C, 180 rpm, 10% water content (phosphate buffer, 0.1 M, pH 6.8; based on the weight of oil), various amounts of immobilized dried cells, 9.65 g of soybean oil, stepwise addition of 0.35 g of methanol (methanol/oil molar ratio of one) after 0, 24, and 48 h, respectively. To study the effects of the water content on methanolysis, various water contents (from 0% to 20%, based on the weight of soybean oil) were investigated. It has been reported that an appropriate water content gives rise to an efficient lipase-catalyzed methanolysis by providing enough organic solvent/water interfaces for the reaction to take place (Lin et al. 2011). Additionally, the lipase from R. oryzae cells exhibits 1(3)-regiospecificity, while acyl migration can occur spontaneously in any water-containing system, which can improve the final ME content in transesterification (Kaieda et al. 1999). These viewpoints might explain why high water contents resulted in an increase in the final ME yield when the water content was fewer than 5% (Fig. 3). Moreover, with low water content, a high methanol concentration would lead to an irreversible denaturation of the lipase (Ban et al. 2001; Du et al. 2004; Zeng et al. 2006). Thus, the lipase proved to be inefficient in the absence of water, as well as at low water contents (Fig. 3). However, excessive water would impede the positive progress of the reaction (on the basis of the balance in the reversible reaction) because water is a product in the esterification of free fatty acids (Lin et al. 2011). In addition, the efficiency of the reaction would be decreased because of the obstruction of mass transfer caused by a larger quantity of water (Arumugam and Ponnusami 2014). That is why the ME yields were markedly reduced at 15% and 20% water content when compared to 5% and 10% water content (Fig. 3). As shown in Fig. 3, the highest ME contents were attained with 5% and 10% water contents. The optimal water content helps prevent irreversible lipase denaturation caused by a high methanol concentration during the reaction. Therefore, 10% water content was used for biodiesel production in subsequent experiments. GA-treated and -untreated cells were respectively added to a mixture containing 9.65 g of soybean oil and 0.35 g of methanol, with 10% water content, for repeated reactions in each batch cycle. For GA-untreated cells, it was found that the ME yield gradually decreased as the batch proceeded and gave a ME yield of only 7.7% at the end of the twelfth batch cycle (Fig. 4a). Comparatively, the ME content in the reaction mixture was 21.6% at the end of the twelfth batch cycle when the same amount of GA-treated cells was used as a biocatalyst (Fig. 4a). GA treatment did not affect the lipase activity, as a 32.0% ME yield was attained when untreated cells were used as biocatalysts in the first batch reaction and a similar value (31.6%) was attained after GA treatment (Fig. 4a). The catalytic stability of the biocatalyst was evaluated by normalizing the deactivation coefficient and half-life to the Arrhenius equation and plotting the first-order deactivation model. 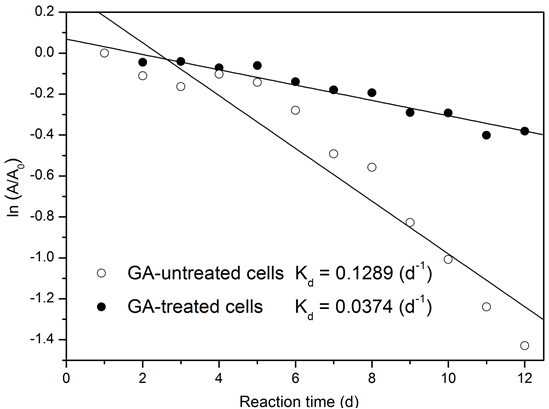 A half-life of five days and a deactivation coefficient of 12.89 × 10-2 d-1 were calculated for immobilized cells without GA treatment, while the GA-treated cells revealed a half-life of 19 days and a deactivation coefficient of 3.74 × 10-2 d-1 (Fig. 5). Compared to GA-untreated cells, the half-life of immobilized cells had a 3.4-fold increase, suggesting that the usability of immobilized cells could be extended by GA cross-linking treatment under continuous operation (Andrade et al. 2014). It has been reported that the leakage of intracellular lipase from the cells could be effectively prevented by GA treatment (Ban et al. 2002). The half-life extension was primarily caused by a decreased amount of lipase leakage from GA-treated cells, through a more gradual catalytic activity loss of the intracellular lipase during batch cycles, than the untreated cells. Because it has been reported that GA-treated cells express higher methanol tolerance (Sun et al. 2010), the time courses of methanolysis catalyzed by GA-treated and -untreated cells with three stepwise additions of methanol were carried out for repeated reactions in each batch cycle. As shown in Fig. 4b, a ME content of 4.1% in the reaction mixture was found at the end of the sixth batch, which indicated that the catalytic activity of GA-untreated cells dramatically decreased. In contrast, the catalytic activity of GA-treated cells showed no obvious decrease during the six batch cycles, where ME yield in each cycle reached 82.2% to 92.2% during the 72-h reaction. Ban et al. (2002) utilized R. oryzae cells immobilized within polyurethane as a whole-cell biocatalyst for biodiesel production. After GA treatment, the biocatalysts were carried out to catalyze the methanolysis of soybean oil in a solvent-free system with three stepwise addition of methanol for six batch cycles, with ME yield in each cycle reaching 70% to 83% within 72 h. Utilizing R. oryzae cells immobilized within loofah sponge shows a higher catalytic efficiency as compared to Ban’s results. It is most likely due to the high hydrophilicity on the surface of loofah sponge, which is generated by abundant hydroxyl groups that are present in lignocellulose (Martinez et al. 2015); higher hydrophilicity provides more oil/water interfaces for the reaction to occur. These results indicate that the LSP-immobilized cells show a remarkable stability in cross-linking treatment with GA solution during repeated biodiesel production. However, the reaction time needs to be shortened when using LSP-immobilized cells for practical biodiesel fuel production. Thus, the catalytic rate of whole cell biocatalysts is currently under investigation. Loofah sponge can be used as a carrier for oryzae LY6 cell immobilization in biodiesel production. Loofah sponges have many advantages, such as renewability and biodegradability, over traditional immobilized materials (such as polyurethane). After cross-linking treatment with GA solution, the LSP-immobilized cells showed remarkable stability during the repeated reactions, which is a promising prospect for biodiesel production. This work was supported by the National Natural Science Foundation of China (No. 31170537, 31370572) and the Priority Academic Program Development of Jiangsu Higher Education Institutions (PAPD). Article submitted: August 26, 2015; Peer review completed: October 24, 2015; Revised version received: November 2, 2015; Accepted: November 7, 2015; Published: November 30, 2015.